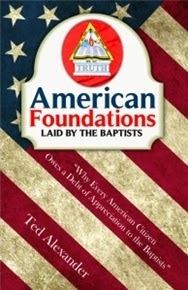 "American Foundations Laid by the Baptists" by Ted Alexander (ISBN: 9781611191431) is the perfect place to begin if one desires to learn about Baptist history and the movement's impact on religious liberty (which is one of the distinguishing features of America). Unfortunately, many of today's Baptist Christians don't know about their heritage. This ignorance stems from learning about Baptist history from Catholic and/or Reformed (Protestant) proponents. But the facts speak for themselves, and Ted Alexander has done a masterful job covering intricate details while presenting them in a straight-forward fashion. If you are looking for a book that celebrates America's greatness and the contributions of the Baptist movement towards that greatness, then look no further. American Foundations covers the Greatest Awakening of the Separate Baptist Revival, the struggle for liberty of conscience highlighting Dr. John Clarke, the contributions of Virginia Baptists to the Bill of Rights, and the lesser known Baptist patriots that help defend and seal America's independence. The value of this book easily outweighs the cost. The Birth, Growth, and Health of America: It was no "accident." (C) 2015. Softcover. 109 pages of good reading. Published by Baptist Truth Publishing. Ted Alexander is an itinerant Baptist Evangelist. You may view his website here.